I was very pleased to be selected with Valde to ride on the Welsh Senior Home International team at PSG level. We had a brilliant weekend, full of fun and team spirit. Valde was very full of beans for the first two days tests, it was a very big arena for him and quite an atmosphere. He had settled more by the third day and finished individual 4th over the two days with the team finishing 3rd. ​Valde and I went to our first premier league competition together at Myerscough. After a very inconsistent preparation due to the weather I was super happy with him. He showed some tension on the first day to finish half way through a big class on 63% but I was really happy with how he dealt with the atmosphere and the arena. The next day I was able to put a little more power into the test, we still made a couple of big mistakes that were very expensive but finished in overall 12th place on 66.1% from a very competitive class of 28! The difference between 4th and 12th was only 1% so once again it showed that without the mistakes we would have been right up there with the leaders! I absolutely loved riding the tests at this show and feel like our partnership is developing more and more with every show! 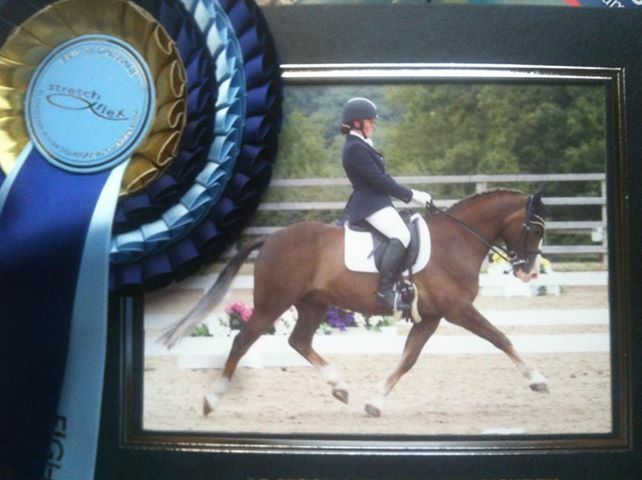 ​Both Valde and Bobby went to the Winter regionals at Myerscough. Bobby went as the current double regional champion with a much tougher job to do in the Medium Freestyle Gold Section and Valde in the PSG Freestyle. Both horses felt a little under par after their recent good form but still both placed 6t in their respective classes in very hot company. ​Rowangarth Rhydian made two trips out to Foxes in the run up to the regionals. He is being aimed at the Senior Home International this year so needs to gain consistent marks to put forward at Medium Level. He started this well by gaining 69.03% and 70.8% in these two classes. Le Patron VD Horne who I ride for Sue Bradshaw and Linda Lind also competed in the novice classes gaining 68% and 70% to win both of his classes. ​Valde and I went to our first big show of the season at Addington. He really rose to the occasion coming 5th in the PSG on the first day with 65.8%. The second day he felt even better and more relaxed in the arena. He produced a lovely test to get 68.29% finishing 2nd in his section and 5th overall from a large class. Some tension crept in again in the freestyle but he still managed to win his section with 66.13%. I went to this show purely to see how we wold fare against the best in the country, still both being fairly new to this level. So to finish at the top end of the leaderboard amongst the professionals was more than I could have hope for. 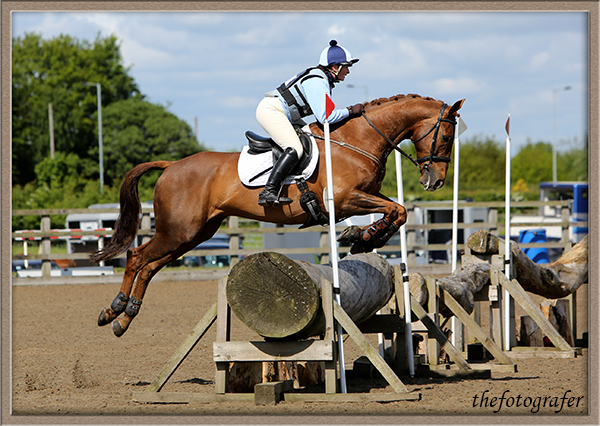 ​Valde and Bobby both had a fantastic trip out to Aintree pulling out personal best scores in every class! ​Bobby won the Medium Freestyle on 72.3% then Valde won both the PSG and PSG Freestyle on 67.2% and 74%! ​​Valde and I had our first championship at PSG level at Field House. We pulled out one of our best tests at this level to finish 3rd on 66.1% just one place off a qualifying ticket! With 16 experienced combinations in the class that result was more than i could have hoped for and we even got a 9!! Valde and I had another crack at the PSG today. This time we felt much more secure and established in the work, he was relaxed and listening to me. Although there were still a few mistakes i was over the moon to win from a class of 7 on 66.58%!! Magnus Infego was in winning form again gaining two more fabulous scores and completing his regional and area festival qualifications on 70.96% and 74.42% in the novices. 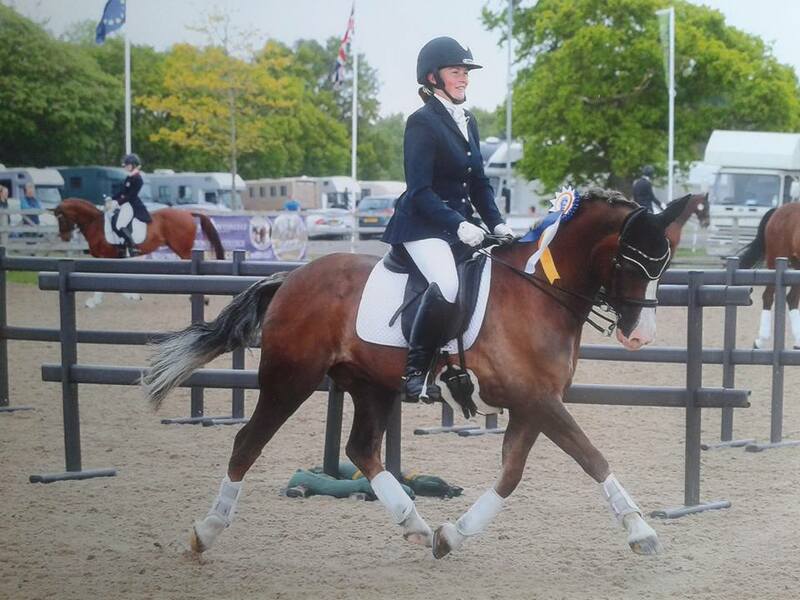 I rode Joanne Mackenzie's Magnus Infego at his first ever affiliated competition. 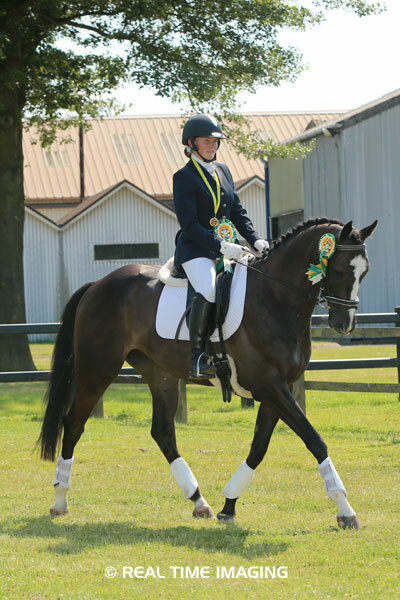 He made a very impressive debut winning the prelim on 72.5% and then the novice on 72.5% again. So whilst Rowangarth Rhydian is having a rest following the Nationals, i was working hard with Valde towards my ultimate goal - the tailcoat!! I decided to just go for it and entered the Advanced 102, i was absolutely thrilled to get 67.50%!! Rowangarth Rhydian and I had possibly our best show yet!!! The first day was the Medium Restricted Freestyle, Bobby was uncharacteristically spooky and nervous unfortunately. A few mistakes and tension crept in keeping our score down but we still managed to finish in the prizes in 10th Place on 66.44%. The next day i was determined to ride better and not come out with any regrets. I was last to go in a long class, last to go is my favourite draw and Bobs felt better than ever in the warm up so i really went for it. We achieved a result i never could have dreamt off - 3rd place at the Nationals!! It was the highlight of our partnership so far and i was on cloud 9 for a long time!! We made the journey home so bobs could have a couple of days in the field before returning to Hartpury on the Saturday for the Advanced Medium Area Festival class on Sunday. Having only done three advanced mediums ever before the show this was a massive ask of him but once again he delivered. I was thrilled to finish in 15th place out of a 30 strong class with less than 1% between us and 6th place. To be so inexperienced at this level i could not have been happier! Hartpury Nationals was a very special week and a big thanks go to everyone at home and at the show who helped us achieve these results! Rowangarth Rhydian becomes DOUBLE MEDIUM RESTRICTED REGIONAL CHAMPION!!! Bobby pulled out all the stops at the regionals to produce his best performance ever, winning both the Medium Restricted on 68.33% and the Medium Restricted Freestyle on 70%. This means he has three classes at the Winter Nationals! Rowangarth Rhydian wins the Advanced Medium Area Festival!!!! a horse from being first sat on to winning a championship at advanced medium is a very special feeling. Made even more amazing as he has only done two tests at this level before he got 67.69% which is more than I could have ever expected. He will now be having a rest through the winter before preparing for the Winter Regionals and Hartpury Winter Championships. Rhonda competed in her second area festival, unfortunately we had a couple of mistakes which kept our marks down and pushed us out of the placings. We finished just under 65% but her way of going was much improved, the mistakes only happened as she was starting to give me a glimpse of what may be to come later in her training so I was very pleased with her. 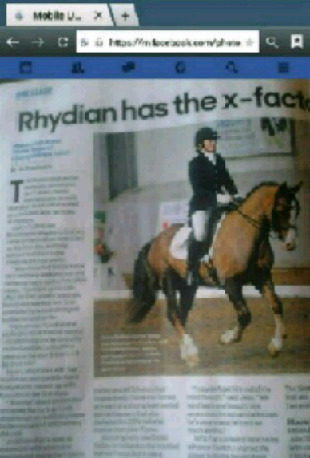 I was extremely excited to be competing at the Nationals with Rowangarth Rhydian again at Medium Restricted level. Nerves got to us both a little and we didn't produce our best test but we finished a respectable 13th place against the best combinations in the country. We also won the award for the best British Bred horse in the class which is an achievement in itself. Rowangarth Rhydian had a quiet trip out to prepare for his trip to the Nationals. He won the M71 with 68.06%. I was very excited to be selected to represent Wales with Rowangarth Rhydian at medium level. This was our first team competition and we had a blast. We were a little out of sorts on the first day of competition and didn't produce our best. However, on the second day we were back on form to finish 4th out of 37 very strong combinations. His was one of the scores that helped contribute to my team finishing in 3rd place overall. It was a very proud day as it's the first time Wales have had a podium finish at the Senior Home International. Rhonda really exceeded all expectations in her first ever championship. In a spooky arena and a very hotly contested class she finished 6th from a class of nearly 30 on 67.2% which is more than I could ever have expected in her first season competing. Valdorama D had a strong win in the Medium 69 on 67.12% in a harshly marked class, finishing 3 % clear of the rest of the class. Rhonda carried on her consistent form at Aintree with a win in the Novice Open Freestyle on 71% gaining her Winter Regionals qualification. She then went on to finish 2nd in the novice on 70.34%. Myself and Rowangarth Rhydian were first to go in a nearly 5 hour class. We posted a 67.66% test, it was a long wait to the end but we finished in 3rd place and gained our ticket to the British Dressage Nationals. We took Rowangarth Rhydian to the beautiful venue of Penrhyd for his regional warm up. We made a few mistakes, but still came away with two wins in the mediums with 66% and 67%. Valdorama D and I competed in our first competition together gaining two first places in the Medium with 65% and the Advanced Medium with 64.5%. We have lots of getting to know each other to do but there were some very encouraging comments from the judges! Rhonda got two strong scores of 67.69% and 71.25% to come second in both novices completing one area festival qualification. Rowangarth Rhydian got another consistent score of 68.82% to finish 2nd in the Medium 75 and also got a very encouraging score of 65% in the training section of the advanced medium. Rowangarth Rhydian and I competed in our first Premier League in the M75. We achieved a personal best score of 72.97% to finish 2nd in the restricted and 3rd overall from a class of nearly 30 professional riders. This was a truly amazing day!!! Rowangarth Rhydian gains another consistent score of 69.35% to win the M71 and complete his regional qualification. Rhonda did her first competition in nearly 5 years today after having two foals. She had a emphatic win in the prelim with over 82% . ​In our first competition back after my pregnancy Rowangarth Rhydian and I won both Mediums at Cockshot dressage with 67.59% and 67.03%. 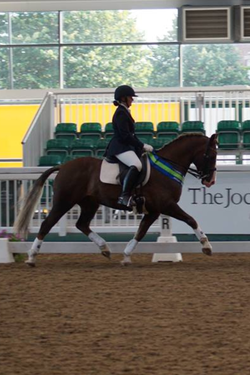 Rowangarth Rhydian qualifies for the Nationals - an eventful weekend in Scotland was rounded off with Bobby picking up a ticket for Hartpury in the Medium Restricted, finishing Second on 68.06%. We were plagued by bad luck in the music classes when the CDs didn't play properly, however he still managed to finish 7th in the elementary Open and 4th in the Medium Restricted music. After a few months break from competing to progress training Rowangarth Rhydian made a wining return to competition taking the Medium 75 qualifier a Cockshot with a solid score of 67%. A good dress rehearsal for regionals in two weeks! Whilst Rowangarth Rhydian is having a little break Excuse Me is getting out more often to gain competition experience and confidence in different arenas. He won both the prelim NQ sections at Haddon with solid scores of 69.58% in both tests, showing his potential for consistently good scores - definitely an exciting prospect for the future. I had the amazing opportunity of attending a music clinic with Tom Hunt, the composer of Charlotte Dujardin's Olympic freestyle, to create Inky's new freestyle routine. The clinic consisted of a 40 minute lesson with Sue to decide on the floorplan, we then rode through it whilst Tom filmed it. Afterwards we had a chat with Tom to discuss music preferences, he then went away and put music to the routine. It was a brilliant day and i'm really excited to see what Tom has come up with for him. Excuse Me did his first competition since July at Aintree, it was also his first go at a music class. We borrowed the music from my trainer Sue Bradshaw as he doesn't have any of his own. He was a little scared of the music at first and tension crept in at times but he still managed an obedient and correct test to finish 3rd with over 71%. Not bad for his dancing debut! Rowangarth Rhydian qualifies for the nationals!!! A very exciting day, Bobby becomes the Medium Restricted Area Festival Champion qualifying for the finals at the Winter Championships in April and winning that special sash!! We made the very long journey to Sheepgate in Boston, Lincolnshire with Rowangarth Rhydian for my last year at the under 25s finals. We had a very enjoyable show, Bobby finished 7th in the medium music freestyle and 7th again in the elementary semi final. This qualified him for the final but we decided to leave a day early so bobby had time to re energise before the area festival two days later. It was a great experience to go to Sheepgate and compete against the best young riders in the country. After a couple of days off Rowangarth Rhydian went to one of our favourite venues, Marian Bach to gain his final Medium qualification sheet for the Petplan Area Festivals before the cut off date - he did this in style breaking the 70% barrier for the first time in a non - music Medium class. He won with 70.9%, got his qualification sheet and felt amazing, even in torrential rain! We made the trip to Stoneleigh Park with Rowangarth Rhydian competing in the Elementary, Excuse Me in the RoR dressage and Havah Ibn Reinatta (Harvey) in the prelim and Novice. Harvey finished 6th in the prelim and 10th in the novice consolation classes after tension on the first day affected his scores. Rowangarth Rhydian once again performed to the best of his ability, coming away with a fifth placing in the elementary national final. 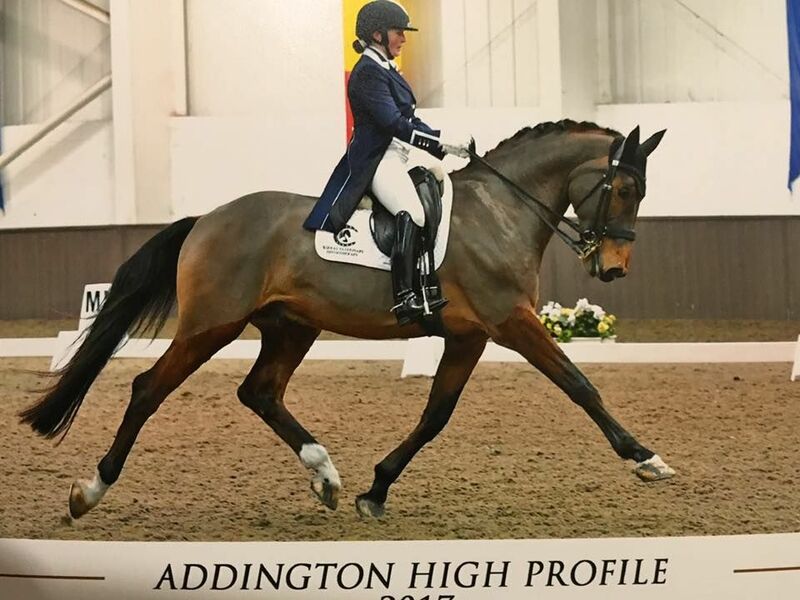 Excuse Me (pictured), at only 5 yrs old and 18 months out of training was an absolute star in the RoR dressage, he was nervous and tense working in with so many other horses and had not experienced atmosphere like at Stoneleigh. He pulled out two strong tests, with some tension, to finish 3rd and standing 1st Reserve RoR Champion. A very proud day for us all and just the beginning of this exciting young horse's future. It was also a great show for my pupil Edward Casswell and his pony Soldier Boy who finished 10th in the Junior Prelim 1st round and finished just outside of the top 10 in the final - a massive achievement for him at his first championship!! Rowangarth Rhydian had a successful show at the Summer Regionals. We finished 8th in the Elementary Restricted on a score of 67.19%. We had a few unfortunate and very costly mistakes which dropped us down the scoreboard but it was still a very positive competition with Bobby improving and strengthening all the time. Excuse Me had a fab show at Haddon winning the NQ section of the prelim with 72.9% and then going on to win the Novice with a solid score of 69.6%. We are so pleased with his progress considering he has only 5 years old been off the racetrack for just 1 year. This was only his second novice test, he score means that he has qualified for the novice RoR finals at Vale View high profile show. I competed Orchestrate (pictured) and Stonehill Steel, owned by Dr Laura Quest, in the BE100 arena event. Orchestrate finishing second on a dressage of 31.5 and double clear. Stonehill Steel finishing 5th on 35.5 dressage and double clear. Rowangarth Rhydian showed his consistency again winning the Elementary with 69.9% and 2nd in the medium with 67.5%. He now has the scores he needed to qualify for the medium area festival. Rowangarth Rhydian completed his summer elementary qualification winning the class with 67% and also winning his first medium of the year competing in the training section. Excuse Me went to Crow Wood for the BD RoR series qualifier. He was joint first with over 70%,qualifying for the final at Vale View High Profile show in November. Rowangarth Rhydian competed again at Foxes in one elementary class, it was a tough marking class but he won with 69.7% gaining 5 more point towards summer qualification, with only 3 points left to get.